We’re excited about this year’s Silent Auction on Saturday, Sept. 22. It’s going to be better and more professional than ever. 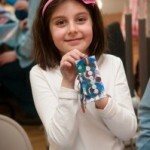 So we’re asking YOU, MAAG member artists, for a special piece of your artwork. And we promise to promote you, appreciate your work, and turn this into an opportunity. 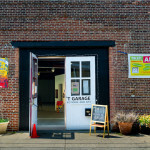 All member work will be juried by the MAAG Curating Committee (you’ll hear more about them another time). 2. Exhibit in our Gallery. The month of September will open as a preview with all artists’ work on display. 3. Video for your own use. We will be interviewing all artists with their work prior to the exhibit opening on Sept. 7. We will then supply you with that video, uncut, at no charge. All proceeds from this evening will go to help us build the artists’ studios. SO, pick something wonderful that you have created, both 2 and 3d work are welcome. Don’t even THINK about looking in your closet. You can download Artist Guidelines and Dates For The Silent Auction here. 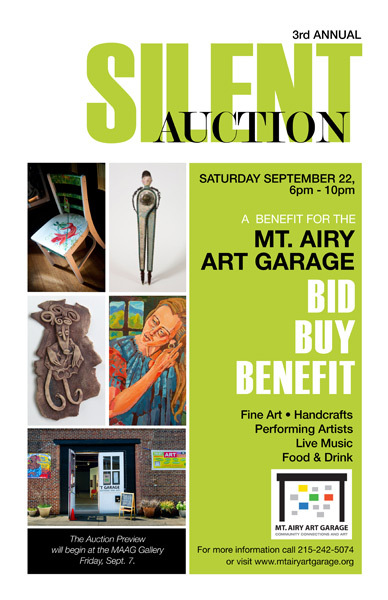 To make your donation or get more information contact linda@mtairyartgarage.org or call 215.242.5074. DEADLINE is August 24.